This popular Narberth hangout takes pride in its Irish heritage with warm hospitality and a fun atmosphere that makes for a relaxed drinking or dining experience. The menu includes a waistline-busting Sunday brunch, adventurous salads, sandwiches and Asian-inspired dishes, and a 16-ounce pan-seared prime rib. 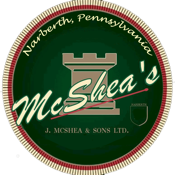 Take the McShea’s Beer Box challenge and earn a personalized mug. Our new app has great features that you can use all the time!